MAC spoofing is a technique for changing a factory-assigned Media Access Control (MAC) address of a network interface on a networked device. Hackers also spoof their MAC address to make them anonymous in the cyber space. You can always spoof your MAC address but can never change it. Means you can show to the network devices a spoofed MAC address but your actual MAC address always remained the same. Open Device Manager. Right Click on My Computer. Click on Manage. 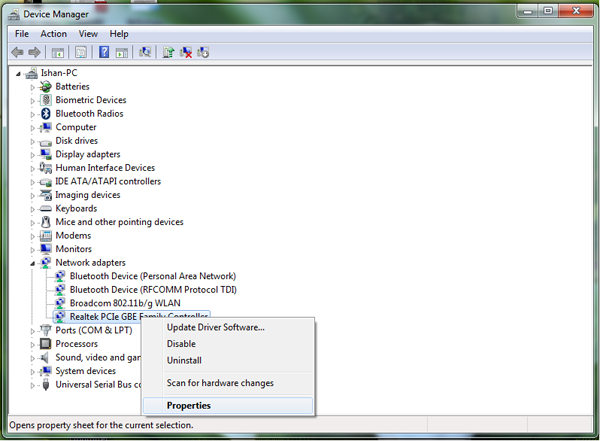 Then Click on Device Manager on left hand side tab. Or Goto Run and type “devmgmt.msc” without quotes. The Device Manager will be opened. 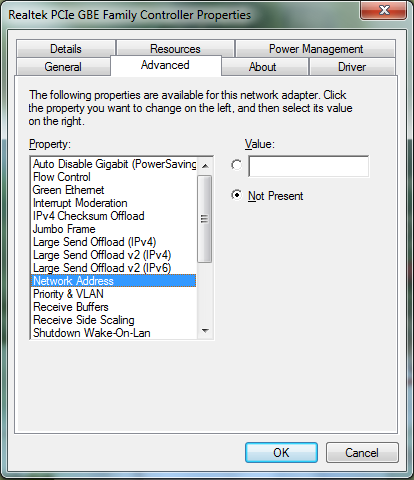 Now goto the “Netwok Adapters” menu. It will list all the network adapters currently present in your computer. 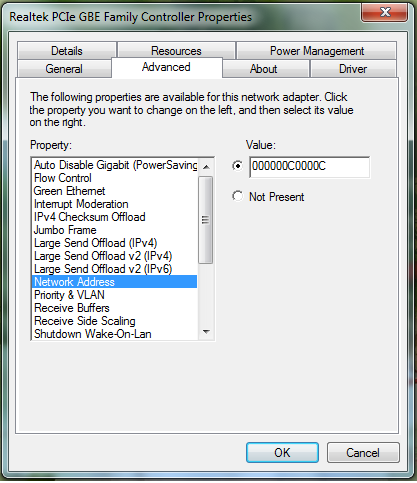 Right Click any adapter of which you want to spoof the IP and goto properties. Now goto “Advanced Tab” at the top and Find the Property “Locally Administrated Address” or “Network Address” in the List Given. It will have two options “Value” and “Not Present”. By default Not Present will be selected, which means windows is using your default mac address. 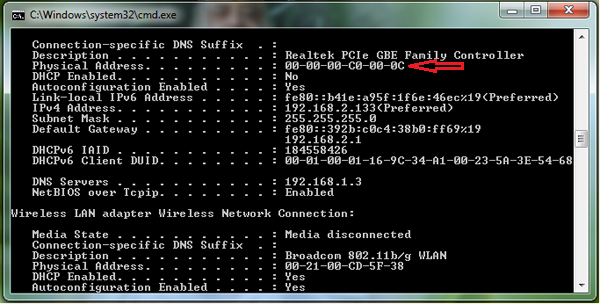 To change your Mac address, Type any 12 digit Hexadecimal(0-9,A-F) Mac Address and click Ok. Window will be refreshed several time and your MAC address will be spoofed successfully. You can verify that Whether your mac address has been spoofed or not by typing the following command at command prompt: “ipconfig /all”. Now goto the Adapter of which you have spoofed the Mac Address. 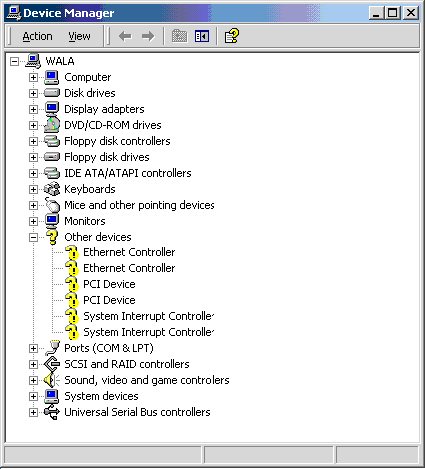 There are several options like “Ethernet Adapter Local Area Connection”, “Wireless LAN Adapter Wireless Network Connection” or “Bluetooth Connection”. Now Look for “Physical Address” and you will see the Change. If you want to Restore your Original Mac Address, Then Follow all the Steps Above and select “Not Present” in Last option. It may happen that the above process which i have described to spoof MAC Address will not be available for some network adapters. So I will provide you with a software to change the Mac Address in my next post. Hope You Like it. Enjoy Learning with TechInSpirit!!! !